At least two men were spotted carrying assault rifles outside Obama's speech. (CNN) - At least two Arizona men brought assault rifles to President Obama’s speech Monday to the annual Veterans of Foreign Wars convention in Phoenix. 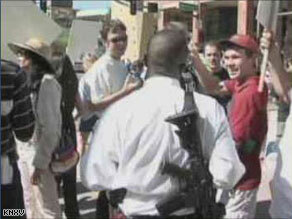 CNN’s Ed Henry reported that one of the men was carrying an AR-15 assault rifle and shouted anti-Obama slogans. The men remained outside the convention center where the president was speaking. Henry said U.S. Secret Service and local police were "very much aware" of the situation and were paying close attention to the men. However, Arizona is an open-carry state, meaning it's legal to carry firearms in public as long as they are visible. i tell you this nothing!!! better not happen to the President Of The United States Of America. because all hell well break loose!!!. so protect him ,THE PRESIDENT OBAMA ,with all your prayers. AMEN! !